Talitha Butterfield has a degree in Contemplative Psychotherapy from Naropa University and is certified in St. John Neuromuscular massage therapy. Talitha has studied nutrition with the Crayhon Research Institute. She has led women's wilderness retreats and taught cooking classes. Her passions are the recognition of spirituality through food, art, nature and relationships. Dan's background reflects a forty year passion for natural health. He is a 1983 graduate of the Boulder College of Massage Therapy and has studied with Judith Delany Walker, Paul St. John, Leon Chaitow, the work of Jean-Pierre Barral and Thomas Hanna Somatics. 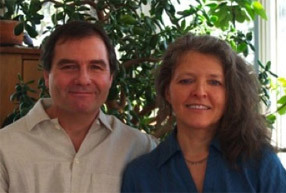 He has taught continuing education in soft tissue techniques and has mentored massage therapists for many years. Dan has more than 30,000 hours of clinical experience working with a wide range of health conditions, integrating a spectrum of therapies into his practice, including diet, nutrition and exercise therapies. Additionally, he has studied with nutritionist Robert Crayhon, and regularly attends seminars on the most current nutritional health research. Dan has taught nutritional classes, advising many people on health issues with personal diet, nutrition and lifestyle recommendations. Dan has also been a dairy farmer with experience in natural farming and gardening.